Wishing the Luck of the Irish on Our Adoptable Dogs! 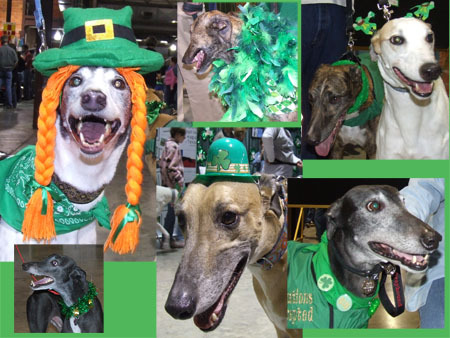 GALT's greyhounds were out in force this year for the Irish Festival, and showed up with an impressive array of green finery! The GALT booth won a second place trophy for Best Cultural Display! It proudly joins our second place trophies from 2003 and 2009. Thanks to all who brought foster dogs for this very special Meet & Greet -- and also to those who supported us by attending the event with their own greys.